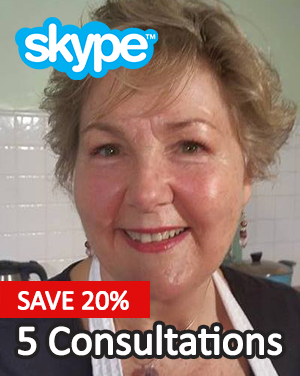 This is a series of 5 half hour consultations with Margie Hare via Skype. It is available to anyone, anywhere in the world by appointment. Once you have made your purchase, Margie will contact you via your email address provided and set an appointment time with you. After each appointment, you will be able to arrange the next appointment with Margie. This is a great option for you to have Margie help you will your progress going forward and consult with her as you progress through the stages of resolving your problem. A one page summary of your current problems you would like Margie to help you resolve. A device with the Skype app, or program installed on it. You will need to send Margie your "Skype Name" so she can call you on Skype for the appointment.